I'll admit I'm treading a narrow path between love and hate for the Middle East, at this very moment. My reasons? Well I've noticed a shift in the way women are treated as well as behave in certain beloved Arab worlds that shall remain nameless. Also, I can't help but feeling offended every time the word "infidel" is used these days. Because it is done in a serious tone -- not jokingly as this wonderfully named film did years ago -- and with the implication that my life and safety are worth less than the life and safety of someone who prays to a different god. But just when I find myself venturing down a road of no return, fueled on by the panic-loving news media and the terrorist actions of a few dangerously misguided criminals who watched way too many video games as teenagers, in comes a festival of cinema, food, art, photography and dance -- to show me the right way once again. The Middle East Now festival in Florence, Italy is a celebration of life, and love. In fact, this year their theme is "Live & Love Middle East", and it couldn't come at a better time, with a better motive. The Middle East Now is the only festival of its kind to include the entire Middle East in its line-up... Yes Israel has and always will be part of the region, and the folks who program the festival don't allow political or religious agendas to cloud their own "cinema with a conscience" mission. This year, I crave the cultural elegance instituted by the festival founders Lisa Chiari and Roberto Ruta, a duo who truly understand the need for conversation, information and communication to reach a global understanding. 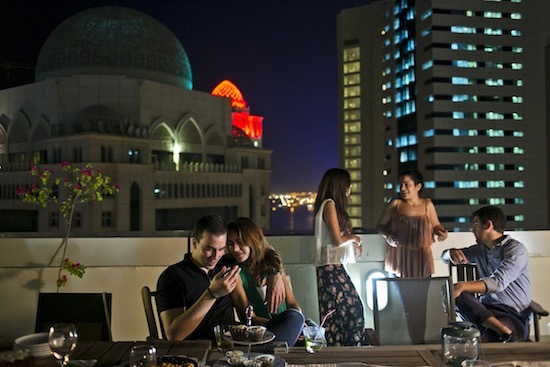 It is within the welcoming arms of this year's Middle East Now that I plan to reconnect with a region that will eventually come out from under the shadows of extremism, violence, displacement and confusion, to become once again the epicenter of the civilized world. Here are a few highlights, which are bound to find many more cultural companions to crowd my heart, once the festival kicks off on April 5th. I've long been a fan of imperfect heroes, and I find cinema is always better when an underdog is involved. In Najwa Najjar's Eyes of a Thief, which was Palestine's entry to the Foreign Language Oscar race last year, I found both those prerequisites within the character of Tareq, an antihero played with wondrous nuances by Egyptian superstar Khaled Abol Naga. Apart from Naga being the best actor to come out of the Arab world in a long, long while (dare I say, since Omar Sharif? Yeah, I do!) Najjar possesses a great talent for keeping her audience intrigued, without using commonplace cinematic tactics. I went into Eyes of a Thief after having read some of the reviews and I said it then and I'll repeat it now, that's a mistake. The film builds beautifully if approached as the mystery that it's meant to be, so do yourself a favor and skip reading about it. Just watch it! The film will be the closing night selection of this year's edition of the festival, featuring a special musical performance by Algerian singer/songwriter Souad Massi, who co-stars along Naga. And, fingers crossed, a personal appearance by both the actor and filmmaker Najjar. I think culture is best transmitted through food. If we all brought to a proverbial common table our favorite dish and sat down to share it with strangers, we would discover that what we have in common is much more plentiful than what makes us different. Farmer, food artisan and culinary activist Kamal Mouzawak hails from Lebanon, but to hear him speak in this TEDx video above, one would think he's Italian, or Spanish or originating from anywhere else that celebrates bread, love and life. Make that human, I mean. Mouzawak is the founder of both Souk el Tayeb, an organic market that features products from local Lebanese farms and Tawlek, a cooperative restaurant in the Mar Mikhael neighborhood of Beirut, where every week he invites a different local cook to prepare typical Lebanese dishes from different parts of the country. His presence in Florence will encourage a discussion of similarities while also celebrating our differences, which to me represents the perfect balance of life. He'll host a special dinner on the 7th of April at the famed Teatro del Sale, as well as teach a cooking class on April 9th at the Scuola d'Arte Culinaria Cordon Bleu. 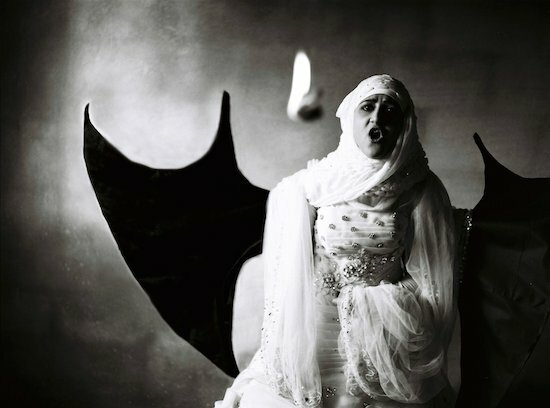 Connect with the real Syria, through "Our Limbo" and "Live, Love, Refugee"
An image by Natalie Naccache from her exhibit titled "Our Limbo"
Multi-cultural master photographer Elliott Erwitt once said, wisely, "photography is an art of observation... I've found it has little to do with the things you see and everything to do with the way you see them." How many of us have stood in front of an image at an art show, or glanced at a photograph held just a moment longer on our televisions and found ourselves heartbroken? I know I have and I can still tell you today what those images were and why they touched me so deeply. Both photography exhibits at this year's Middle East Now deal with Syria, a country we've all pretty much thrown to the dogs. And yet there are still people like professor Thomas Webber, an American who has called Damascus home for the past four decades, finding poetry within its walls, as I read recently in this AP article. In this same vein, Lebanese photographer Natalie Naccache has immortalized a group of young Syrian women who continue to live their daily lives as citizens of their majestic country, and yet watch its story from afar... From the far corners of Qatar, Dubai, London and NYC, the women of "Our Limbo" are featured in a photo diary of life put on hold, away from the place they long to call home once again. In "Live, Love, Refugee" Beirut-based, Syrian born photographer Omar Imam shows the human faces of the daily migrant crisis Europe is experiencing, often lost behind the headlines. A bit reminiscent of the series Humans of New York, with stories to go along with the photos, the exhibit is bound to tug at the heartstrings. I'm bringing a box of tissues along, just in case. Both shows open on April 9th and run through the month of April at Aria Art Gallery. 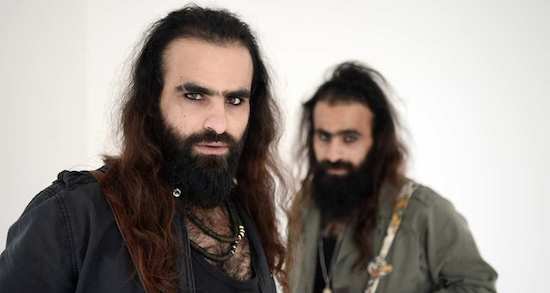 When you first meet Palestinian filmmakers and artist duo Tarzan and Arab Nasser, who in cinematic circles are just known as Tarzan and Arab, no last name needed, you may wonder, as I did, if they are as wild as they appear and if their incredibly colorful persona will translate to the big screen. They have a wonderfully poetic story accompanying them, they watched their first film in a movie theater in the US, thanks to a benefactor who heard that Tarzan and Arab had never had a chance to watch cinema in a cinema in Gaza, where they grew up. The twin brothers, apart from being striking in every way, are also incredibly kind, funny and don't take themselves too seriously, which to me is always a sign of greatness. So, that's how I feel about them. But what about their first feature, Degrade, which premiered last year in Cannes and stars Palestinian superstar Hiam Abbass? Did it make the grade? The short answer is yes, even if some of the critics don't agree. Of course, what do critics know anyway?! That said though, I would also like to see more from the brothers, and their producer Rashid Abdelhamid, something where they step off the beaten path and make a film that explores all the wondrously poetic, artistic spirit they possess, both inside and out. While we are still on the subject of Palestine and Abdelhamid, the enterprising producer behind Tarzan and Arab has come up with a fashion line of traditional Palestinian keffiyeh redefined in a non-traditional way. He'll be bringing his latest collection to Florence, to my favorite shop Gerard to be exact, on opening night to kick off the festival in style. To someone who loves clothes and food as much as films, this makes an already mind-blowing festival seem like a dream come true, adding just the right amount of fashionista to the mix. 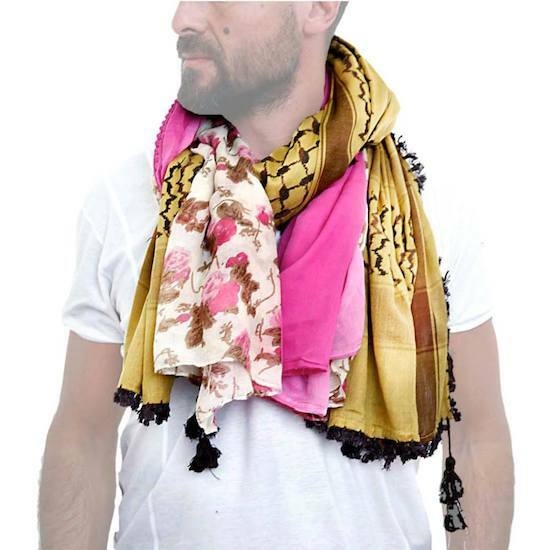 Plus the scarves are all one-of-a-kind sustainable creations made in Palestine and perhaps it's time we adopt the slogan "Make Fashion, Not War!" Oh, and don't even get me started on men who have the courage to wear pink! For all info about the seventh edition of Middle East Now, which runs from April 5th through the 10th, check out their website. All images courtesy of the Middle East Now festival, used with permission.